In the continuing fight over Texas’ voter ID law, a federal judge on Monday ordered state officials to change, where possible, the language used to inform voters and poll workers about acceptable voting procedures for the November election, according to a lawyer for those challenging the state law. U.S. District Judge Nelva Gonzales Ramos ordered state officials to abandon more restrictive language used to describe who is eligible to vote on Nov. 8, said Chad Dunn, a lawyer for Democratic U.S. Rep. Marc Veasey of Fort Worth, the League of United Latin American Citizens and several voters who lack government-issued identification. “Hopefully, we got some clarity going forward, and that message can get to voters,” Dunn said. See here and here for the background. The crux of the argument was that the original judge’s order was to allow an opportunity for people who “do not possess SB 14 ID and cannot reasonably obtain it” to be able to vote, while the state’s wording in its election materials was that people who “have not obtained” and “cannot obtain” SB 14 ID may vote. Among other things, this led to County Clerks like Stan Stanart threatening to prosecute anyone who didn’t meet his standard of not having an accepted form of ID. Rick Hasen has a copy of Judge Ramos’ order. As his reaction to the order shows, it was more than just the state needing to abide by the original agreement, which they themselves had a part in crafting. ThinkProgress explains. For one thing, as the Huffington Post’s Cristian Farias notes on Twitter, Judge Ramos’ Tuesday order is stronger than a proposed order drafted by some of the plaintiffs in this case. The proposed order would have largely clarified that the court’s original order meant what it said. Judge Ramos’ Tuesday, order, by contrast, requires Texas to take several specific actions. It also subjects Texas to a kind of federal supervision similar to the oversight it faced before conservatives on the Supreme Court gutted a key provision of the Voting Rights Act. Among other things, the Tuesday order requires Texas to “re-issue its press releases concerning voting to properly reflect the language in the Court’s Order,” to “edit the poster to be printed and placed at polling locations to accurately reflect the language in the Court’s Order,” and to “edit digital materials on its website page(s) that address voting rights and procedures, including titles or headlines and FAQs” to bring them into compliance with the original court order. Significantly, the Tuesday order also provides that “the State of Texas shall provide to counsel for all Plaintiffs scripts and copy for documents and advertisements that have not yet been published for review and objection prior to publication.” As a practical matter, this gives the Justice Department (as well as the private plaintiffs in this case) the power to read over and object to new elections related materials before those materials are published. Perhaps that will prevent these shenanigans going forward. I sure hope so. In the meantime, the Chron reports that Judge Ramos has denied the plaintiffs’ motion on the side issue of what if anything to do about clerks like Stanart. That’s a line that hasn’t been crossed yet, I guess. During an appearance on Laura Ingraham’s radio show today, Lt. Gov. 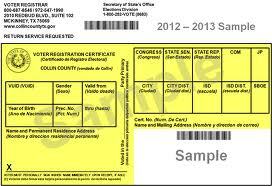 Dan Patrick says the Texas Legislature will try to pass a new voter ID law in the next session. Remember that the full Fifth Circuit Court of Appeals upheld Judge Ramos’ finding that the voter ID law had a discriminatory effect, and that the question of whether the law was enacted with discriminatory intent is yet to be decided. If the answer to that second question is ultimately found to be Yes, then not only is the law completely voided, then the state could be put back under preclearance under Section 3 of the Voting Rights Act. Given all of that, does anyone believe for a minute that a new voter ID law that meets Dan Patrick’s approval can pass legal muster? Because I sure don’t. This issue is going to provide long-term employment for all of the attorneys involved. The Trib has more. How the Republican are working to thwart the federal court orders here in Harris County and I would assume in other counties. Precincts that have always been opened during presidential elections will be closed and merged with other precincts that have never or hardly ever been used in combination.